Enhance your home decor with this colorful canvas abstract 'Misty View I.' 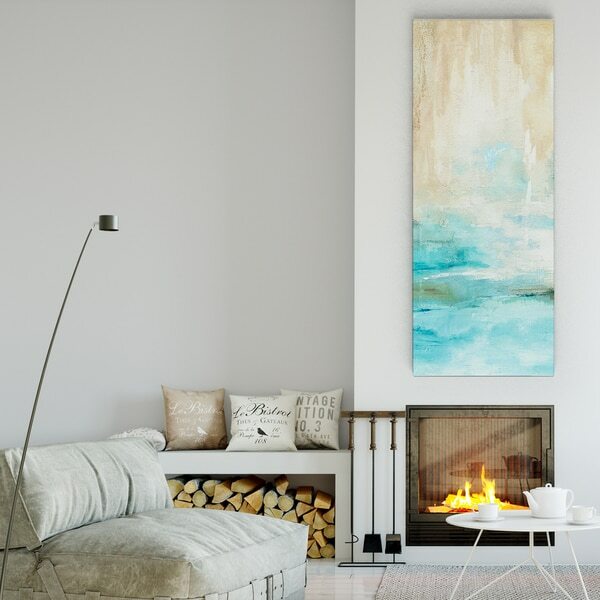 This canvas spices up your room with bright blue and tan shades for lovely color and a peaceful theme. Carol RobinsonCarol Robinson is a native of Salt Lake City, Utah, but through the whirlwinds of life, she has been relocated to Alberta, Canada, where she has learned to love small town life, embrace winter in all its glory, climb the Rocky Mountains on a weekly basis, and live and breathe hockey. Carol has always loved to draw and paint. Formal schooling took her through three years of university study only to gain an MRS Degree, acquire one wonderful husband, three fantastic children, five (and counting) grandchildren, assorted animals, and 26 years of learning to navigate the art world. Carol feels that through creating artwork for various clients, and keeping up with the hottest trends, she has grown more as a hands-on artist than she ever did as an art student. Lessons learned as a professional artist have been invaluable and stretched her abilities far beyond anything she could have imagined. Carol loves to experiment, and often combines many mediums with digital art to create her diverse looks. She has added photography to the mix and enjoys seeing the world anew through a lens as well as through her already keen artistic eye. Carol says that virtually everything I see can inspire a piece of artwork and it is a marvelous way to look at our world.